I might not have mentioned it previously but the wife and I have been doing a lot of walking. Usually, we'll try to take the girls (dogs) out with us and have worked up to a 4-mile hike a few weeks ago (hours before Super Bowl.) There has been a reason. Sure, the health benefits are great (as is wearing out the dogs.) But, Kerry has a goal and I'm going to support her every step of the way. 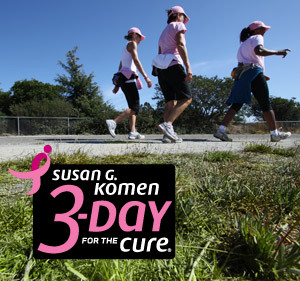 In November, Kerry is heading to San Diego with her BFF to participate in the Susan G. Komen 3-Day for the Cure event. This isn't a simple little trip. Essentially, they will head out and walk 20 miles, camp out, pack up, walk another 20 miles, camp out, pack up and walk the remaining 20 miles in what can only be called a 3-day endurance test. So, she's in training. I mean, it isn't often that anyone walks for 20 miles continuously or does so 3 days in a row. Yes, training will be difficult but also difficult will be fund-raising. Neither of us have really ever done that before either. They have set a minimum of $2,300 in donations as her goal before she participates which means we have until September-ish to work on it. I try not to use the web sites or my other ventures as a platform for asking for things... I am bad at that but, during the next few months, I will be trying to keep you up-to-date on Kerry's training progress and post a little link up. We also hope to hold a few fund-raising events as well. Right after signing up, a friend of hers told her that her other friend had just been diagnosed with breast cancer. Cancer, itself, is scary but when it hits home, it hits hardest. Men also get breast cancer. One of the sad things about the disease is how it can destroy a woman's self-esteem. Anyone who knows me, knows that I think breasts are one of the most amazing inventions and I can stare at them for hours. Let's go save some boobies! It might be good to mention now that unfortunately, donations from outside the United States are unable to be processed but we would like to thank you for even considering it. I can honestly say that I failed the Pepsi Challenge over 2 decades ago. I just like the taste of Coke. For the longest time, I was a 2 20-oz. bottle-a-day Diet Coke drinker (yeah, caffeine.) Anyhow, I don't drink soda anymore but this article saying that they've finally revealed the recipe for Coca-Cola got me thinking. First, it's hard to say 'finally revealed' as they say it was found in a 32 year-old newspaper. It's like saying, "We can finally reveal the winner of the first American Idol." It happened, was covered and it's done. But can the recipe be real? So, if this this recipe is false, it is blatantly so. 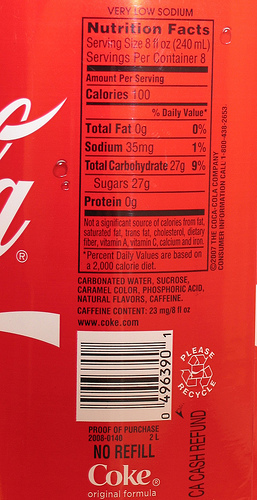 If it were correct, it could be an issue with mis-labeling the product -- which could be a lawsuit. 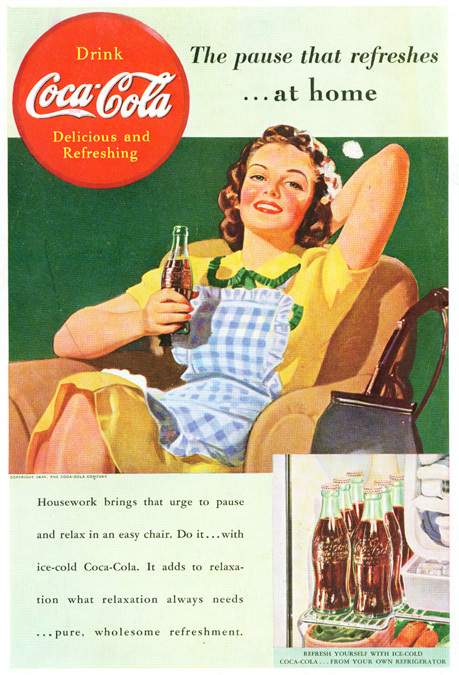 It also must be noted that the above label has to be an older one as high fructose corn syrup is the major sweetener used today. Could that recipe, printed in a newspaper 3 decades ago, be a very early one that was discarded, changed and rendered useless by the time it was published? Something to consider. This will be a rather long update but it's a few stories that intertwine. I might have mentioned elsewhere that we were getting our son back on his educational path by adding some new structure to his after-school hours. This came after seeing quite a few missing homework assignments. He now spends at least 90 minutes at the kitchen table doing homework before anything else. He has actually noticed how much better his life has been around this new change and how breaking away from it feels so disorganized and confusing. Anyhow, he spent two late nights catching up on late/missing homework assignments that brought his Science and English grades up. (As he had A's on most everything but many zeroes on homework brought the grades down.) I might have also mentioned his teacher and assistant dean approaching us about having him represent the 7th grade in the Science Bowl. This is actually a state-wide competition over science and math that is now in its 4th year. Most likely... this wouldn't have happened if he didn't bring those grades up. So, on Thursday (the 27th) David broke from the previously mentioned structure -- with our consent. He went to play with his cousins that he hadn't seen in awhile but promised to get to his homework right afterwards. That didn't happen. While playing on his scooter, the rusted handlebars gave and he went tumbling to the ground. All in all, he wound up with a buckle fracture of his right radius (near his wrist) leaving him without the use of that hand for the time being. He tried writing with his left but switched back after getting his full cast. All homework has caught up but it's been quite an experience for him as he's learning how much he depends on using both arms. Fast-forward to 4:40am this morning as the wife woke him up to get ready for the Science Bowl. Heck, I even went to sleep early and got up to go with them. We arrived at the Henderson International Campus at 6:30am and turned in some last-minute paperwork for his participation. Worth noting here is that writing out anything is a slow painful process during the healing and hardly legible (and never really considered how important that may be for math questions.) We weren't allowed to see the first 2 contests but we got a phone call from David around their lunch break to tell us that they had won both their first head-to-head battles. Arriving quickly afterwards, we just made it in as they started against their next opponent. They won and had a little breathing room. I found out that my old junior high school (that I participated in Varsity Quiz for) was also competing... and was the team to beat. They would meet them in the finals. By the first half of the game, they were down by at least 20 points and came back to a nerve-wracking finish but lost. David had some tears in his eyes but I reminded him... it's a double-elimination tournament. The team would play their sister-school from Reno for third place and beat them in what was called a North-South battle by moderator Nate Tannenbaum. The next would be a rematch with my former school which had remained unbeaten. David's team dealt them a more than 50 point beating. I can't put it any other way. So, they would play against each other one more time... The other team would bring payback by topping them by 100 points. It was a slugfest... well, mentally. What has to be said here is that the main team consisted of four 8th graders (and a 7th that rotated in on the second half) and David's had an 8th grader, two 7th graders and a 6th grader. Pretty darn good for a team just put together that could only get better next year. So tonight, I remain a proud parent of a child that gave his all and learned to enjoy this competition. I'd feel bad if I wrote all this without saying how nice Mr. Tannenbaum was. Kerry and I have fond memories of watching this meteorologist's forecasts and on-camera wit. But to have him moderate the final rounds was great. He even too a moment to pose for a photo with the boy. It gives David someone to look for on the news in the morning when he fills in for Ted Pretty.